He says that around that time, he realised he was facing issues which needed "special attention" and had therapy for his problems. "I wasn't feeling like myself and I couldn't figure out why," he said on Instagram. He previously scrapped a US tour last year partly because of his mental health, telling Billboard magazine at the time: "I never really took the time out to nurture myself." And his words have had an impact on men of colour who have also struggled with their mental health. "I'm in awe that he's having that conversation," Ben Hurst, who works promoting gender equality in young men and boys, tells Newsbeat. "It just makes it OK. I started therapy recently and I remember when I started, I didn't tell my family, there was a big reluctance inside of me to tell my friends and to have that conversation." Ben says he was encouraged not to talk about his feelings when he was younger and that he would be told to "fix his face" when he was upset. "Particularly in POC (people of colour) communities, there's a big push back on talking about emotion, especially for men," he adds. "It's almost like when you're young, you're taught to not air business out in public, to not talk about stuff outside of the house." Others have praised how openly Big Sean spoke about his mental health, rather than "skirted around the issue." "Sometimes we see statements where artists, musicians or activists talk about 'difficult periods' but they rarely give the name and say they were suffering from anxiety or depression - or, more importantly, say they saw a therapist," says charity worker Alex Leon. He says that often in his community, BAME (black, Asian and minority ethnic) men feel they have to "uphold the family name", which can make people even more reluctant to speak up. 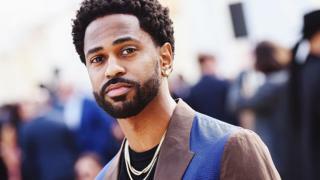 Image caption "Young men of colour don't have many role models when it comes to mental health"
"What Big Sean has done is a good step in the right direction for us to be able to tell men of colour in the media that they should be speaking more openly because we need that representation," he says. Sean says therapy helped him get "clarity" on his situation and was able to focus on relationships which had meaning in his life. "I had a lot of toxic relationships around me," he says. "Even the relationship with my mum was getting to a point where we weren't talking like that. "It was just weird because it had never been like that with me and her." Sean says that his mental health issues meant that he lost interest in making music, saying it began to feel "like a job". "I realised that it all started with me," he says. "I couldn't point the finger at anyone else, I had to point it at myself, nurture those relationships that were important to me but most importantly nurture the relationship with myself." "In the midst of that I definitely rediscovered myself and found a whole new energy and me being the source of it - not somebody else," he says. "Put the energy back into yourself, be clear about what you want to do and just know that it all translates to happiness." Sean released his fourth album, I Decided, in February 2017 but in his Instagram post he suggests that his improved mental health may mean new music is on its way. "I started getting back to making music and it started being fun again and I'm making the best music of my life," he says. "It feels good to be back at a higher level."